The Book Chook: Prepare for Christmas with Disney Prep and Landing Photo Mashup! 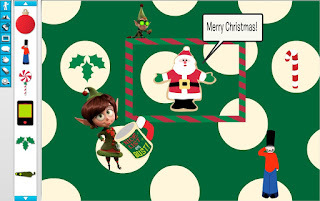 Prepare for Christmas with Disney Prep and Landing Photo Mashup! When it gets to late November, many teachers and parents look for something creative their kids can do, something that also builds a little Christmas spirit. If you're okay with holly, not holy, check out the Disney Prep and Landing Photo Mashup. Prep and Landing is the name of a short animated film made by Disney. It's about an elite group of elves that apparently get houses ready for Santa's arrival. 22 minutes in length, it could be the perfect choice if you're looking for a family-type animated movie this Christmas. And Prep and Landing Photo Mashup means that kids can follow up the movie by creating their own pictures and stories about the movie's characters. The Disney Prep and Landing website has several activities suitable for kids, but I like the versatility of the Prep and Landing Photo Mashup. Even if kids haven't seen the movie, there are lots of elements they can use to create scenes or illustrations for cards, like Santas, baubles, trees etc. It even has editable speech bubbles, meaning kids can create their own cartoons. Basically, kids can choose backgrounds, characters, stamps, speech bubbles etc, just as they would with most comic editors. The results can be printed out and saved if you register. So, it's another great place for kids to play around with words and pictures!